“My Chewable Book of Wheels” is one of my new cloth books for baby and it could be yours in exchange for just a few clickety-clicks. This giveaway has now ‘officially’ ended and the winner will be drawn asap. You can read a description of the book on the Etsy page. So, to be clear, the giveaway item is one organic chewable book of wheels with ribbon and ring, and this includes postage/shipping to where ever the lucky winner might be. Visit the book’s Etsy page and if you like the book, please click on the Facebook ‘like’ button found under the green ‘add to cart’ button. And/Or tweet/pin it. Visit the YouTube video of my chewable book of wheels in action. If you think it’s cute, please give it the thumbs up and leave a comment. Copy & paste & complete the following five statements in the reply/comment box at the end of this page. The giveaway is open to ANYONE over 18 anywhere in the world who has/knows a baby or toddler who would like or love a new cloth book. The winner will be chosen by drawing a number out of a hat on October 20th or as soon as we have ten comments/entrants. The winner will be notified by email. Please contact me with your questions rather than using the comment box. 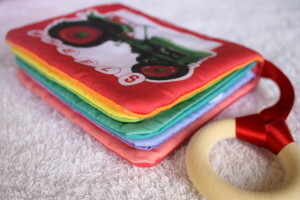 And finally, the lucky winner’s baby will be featured on the ClothBooksForBaby website with a review, photo and/or video! Of course you can opt out of this spot of limelight if you want. Up to you. Off you go now… Here’s the Etsy page. I’d give the book to my little boy or to my friend’s baby born 2 days ago! My best tip for promoting your cloth book: (optional! )I think facebook is excellent, lots of mommies out there! I made a comment on youtube but was logged in under my husband, Ben. Thanks Amy! Susan’s good at word-of-mouth isn’t she?! And to answer your question, yes, I do have a girly book, “My Chewable Book of Blooms”. And I might be having a random giveaway of that one sometime in the future too. 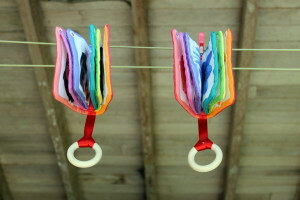 My best tip for promoting your cloth book: (optional!) Let people see them and tell everyone about them. So word of mouth! I heard about this giveaway: on the Etsy forums, then went and checked out your shop! My best tip for promoting your cloth book:(optional!). Always have them , and business cards…let other moms see you using it to calm down cranky baby in waiting room, grocery store, waiting in line at bank, etc. Thanks Jodi! Love those etsy forums! Thanks Bridgette! Lucky last perhaps?